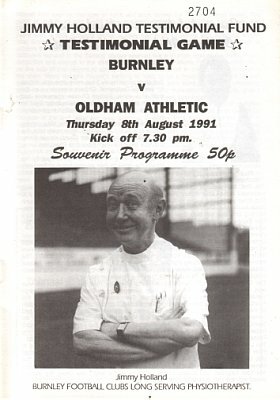 Whilst Burnley were looking forward, if looking forward is an appropriate choice of words, to a seventh successive season in the Fourth Division, Oldham were Second Division champions and about to embark on a three year adventure in the top flight of English football. This was a tough ask for Burnley and, with the season not far away, was a game played with some competitiveness, unlike many an end of season testimonial game. Both teams were at full strength and it was the visitors who showed first and had Neil Adams had his shooting boots with him he could have had the game won by half time. He blasted one shot over the bar, missed a sitter from eight yards out when he screwed his shot wide and then saw Chris Pearce make a brilliant save to deny him. Just before that save came out best chance when Andy Farrell played in John Francis. With Mike Conroy screaming for the ball, Francis tried to go it alone and ran straight into trouble. It was the last bit of action for Francis. He was replaced just past the half hour by 18-year-old Graham Lancashire. He'd just signed his first professional contract and only the night before had hit a hat trick for a reserve team in a friendly at Hebburn. It took him just two minutes to open the scoring. Joe Jakub played a great through ball for Farrell to run onto, and the long serving midfielder beat one man before playing a ball into the near post. LANCASHIRE got in front of his defender to squeeze a shot past goalkeeper John Hallworth to give Burnley the lead. That was enough for Burnley to go in at half time with a lead and that lead should have been doubled in the first minute of the second half with Lancashire again involved. The ball was played into him in the penalty box. He turned brilliantly and was about to get in a shot when he was bundled over by Brian Kilcline and referee Neil Midgley awarded a penalty kick. Unfortunately Hallworth went the right way and saved Steve Harper's spot kick. Burnley were certainly worth their lead by now and the Conroy/Lancashire partnership was giving the home fans in the crowd some real optimism for the coming league season. Both teams made changes and Joe Royle brought on Paul Kane and David Currie, the latter a trialist from Darlington. These two turned the game on its head. On 71 minutes, Currie found KANE who smashed home a shot from the edge of the area. That looked to have ensured the game ended in a draw but KANE had other ideas and, with just three minutes remaining, scored an almost carbon copy goal after again being fed by Currie. And so it ended in a 2-1 win for Oldham, but it was also a great night for Jimmy Holland who for once was excused duties with Harry Wilson taking over as physio for the night. He said after the game: "It was a good game played in the best possible spirit and it has been a very emotional night for me. "I can't remember the last time I watched a game wearing a collar and tie, but I'll have to sit in the stand more often, there wasn't a trainer on the pitch all night." Manager Frank Casper, whilst enjoying the night, was also pleased as the new season moved closer. "We still have some things to work on, but if we play like that in the Fourth Division we won't go far wrong. "We were well organised and played in a controlled way and, although it was a friendly, Oldham were virtually at full strength." Everyone was talking about Conroy and Lancashire, and Casper added: "Mike is a great player and he will do a very good job for us. "Young Graham will be a good player. He shows what Burnley Football Club is all about. He came to us from one of our scouts, he has progressed through the ranks and got a full time contract. He is strong and versatile and shows the value of our scouting system." Burnley were now set to face Preston in the Lancs Manx Cup where nothing other than a big win would see us through to the final. Then, it was Rotherham on the opening day of the 1991/92 league season. Burnley: Chris Pearce, Ian Measham, Joe Jakub, Andy Farrell, Mark Monington, John Pender, John Francis, John Deary, Mike Conroy, David Hamilton, Steve Harper, David Williams, Paul France, Ian Bray, Peter Mumby, Danny Sonner, Graham Lancashire. Oldham: John Hallworth, John Keeley, Gunnar Halle, Andy Barlow, Richard Jobson, Earl Barrett, Ian Marshall, Rick Holden, Paul Kane, Roger Palmer, Graham Sharp, Nick Henry, Paul Moulden, Neil Adams, David Currie, Mike Milligan, Brian Kilcline.